A Special Oiselle Wednesday — MommiesRun. I had know idea what Oiselle would be sending me when I received my box of goodies. Imagine my surprise when I opened the box to find the Holepunch Lux Sweatshirt, Gifted Verrazano Bra, Embossed Roga Shorts, and Mesh Cap. Altogether, these items make one helluva beautiful running ensemble, but let's dive deeper into each piece! When this piece launched earlier this year, I was totally entranced by the beautiful marble print. I honestly wasn't sure about the likelihood of me running in it, so I didn't order it myself. I'm so glad I received this top though, because after 7 miles in it, I can say it is definitely a legit running top! That's not to say I wouldn't totally pair it with some jeans like the goddess Lauren Fleshman does here, but it's amazingly comfortable for running too. The temperature ranged from 50-55 when I wore it, which would normally be short sleeve weather for me. However, due to the amazing holepunch back, I felt breezy and cool. I want to make sure and emphasize how amazing I find the back to be...this fabric might be the most innovative material ever, and the new Holepunch Distance Shorts might need to find their way to me as well! 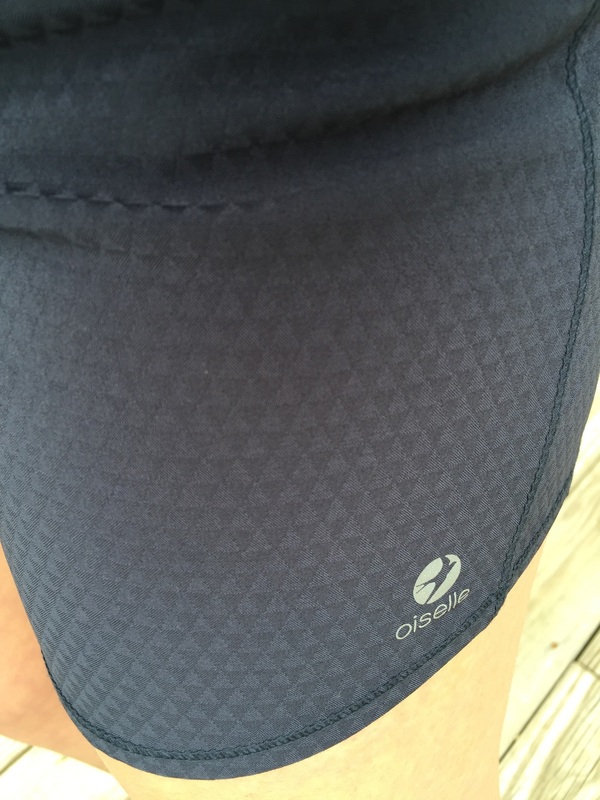 I had no problems with chafing, and I found the material to wick my sweat perfectly. It even absorbed the Nuun that leaked from handheld well! As a huge fan of all things Lux, I want to point out that this Lux seems to be a lighter version of the popular fabric. It's still super soft, but it lacks a little of the buttery smoothness that other Lux items contain. This is not a complaint on my part! Because it is lighter, it allows for a loose fit that feels airy and free. I am wearing a size 6, and I find it to be a perfect fit. The marble print is undeniably beautiful and unique, so unique that no 2 tops will end up with the same pattern! I swear, only Oiselle could do something that cool. You can get your own unique top for $78, which is amazingly worth it. This top is so versatile, and the holepunch back is absolutely a deal maker for me! Here's another item that I probably would have never ordered for myself...because I'm clearly not Gifted in the boobage area. But guess what?! You don't have to be gifted to wear this bra! You just have to want the most supportive yet comfortable bra ever, because that's what this is. Seriously, the moment I put on this bra, I knew I would be ordering another one for Summer running....it's that fabulous. Because the neckline comes up higher than the original Verrazano Bra, it provides unmatched support. While I was running, I never once felt the need to adjust a strap. In fact, I barely thought about the fact that I was wearing a bra! YOU NEED THIS BRA. I don't really know how else to say it. I had no hot spots from rubbing or chafing after runs varying from 3 to 5 miles. The straps are wider which I find to be so comfortable, and they are adjustable to provide the perfect fit. I found that I like the outside straps a little tighter than the middle strap. But it's almost like a "Choose Your Own Adventure" bra, because you can make it work for your needs. It also contains removable pads, which I kept in. As far as sizing goes, I am wearing a 6, and for reference I wear a 34B in regular bras (when I wear a regular bra, ha!). As far as pricing goes, $58 is a steal for this bra. As us ladies know, bras can be pricey, but you will never wear a bra as comfortable as the Gifted Verrazano. Therefore, it is worth every single penny. Like I said, I will definitely be ordering another when it starts really heating up! I love this Black-Geo Bloom Print, but the Burgen-Molecular Print is also calling my name! I have reviewed the Roga Shorts before, so you all know that I live and die by these shorts. They are the shorts to which I compare all other shorts! I didn't really realize that I could love them any more, until I received the embossed Rogas. I absolutely adore the details in these. I don't know if it's my imagination or what, but the embossed fabric feels lighter. I mean how can you possibly make the Rogas any better?? Here's something new for me: I'm wearing a size 6 in these. Normally I've always sized up in the Rogas to allow for a looser fit. But now I'm kind of hating myself, because I really love how the 6's fit. If I didn't have a ridiculous amount of Large/8 Rogas, I might start all over. Alas, I can't part with my favorite shorts of all time, so I'll just have to begin a new collection. It should come as no surprise that I find the $50 price tag completely reasonable. I love these shorts. I love the Midnight color that I received, and I am OBSESSED with the Mineral color that is also available in the embossed fabric. If you haven't tried Rogas, I don't know what you are waiting for! There are even some colors on sale right now! In the words of my husband, "Do you really need another hat?". Well, no, I guess I don't NEED another hat. I mean I also don't need a donut, but that doesn't mean I'm not going to eat one. However, you DO NEED this hat, especially if you run in hot weather and have unruly hair like I do. As the name implies, this hat is made of breathable mesh that allows the heat from your head to be free. When I wear this hat, I feel like my head is cool, which in turn helps to keep the rest of my body cool. Since we all have different shaped heads, the adjustable bungee closure really helps to allow big heads and small heads to wear this hat with ease. I love how light it feels on my head, and despite keeping it tight to avoid flying off in the horrible wind we've been having, it doesn't give me a headache! It has a foldable brim to allow for easy storage...again, who else thinks of something like that?! Only Oiselle! Edited: Um there is now a Roga Hat and Roga Visor. I have no words. 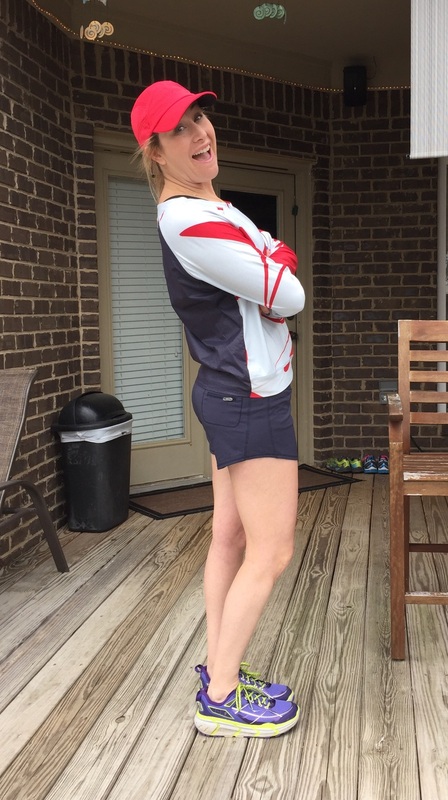 Thank you so much to Jacquelyn and Oiselle for allowing me to review these pieces of the Spring 2016 line. I knew I would love everything, but I didn't realize HOW MUCH I would love it all. Once again, I am reminded how happy I am to be a member of the Oiselle Volée Team! Is it tough for you to find a good sports bra? Do you stock up when you find an item that works for you?